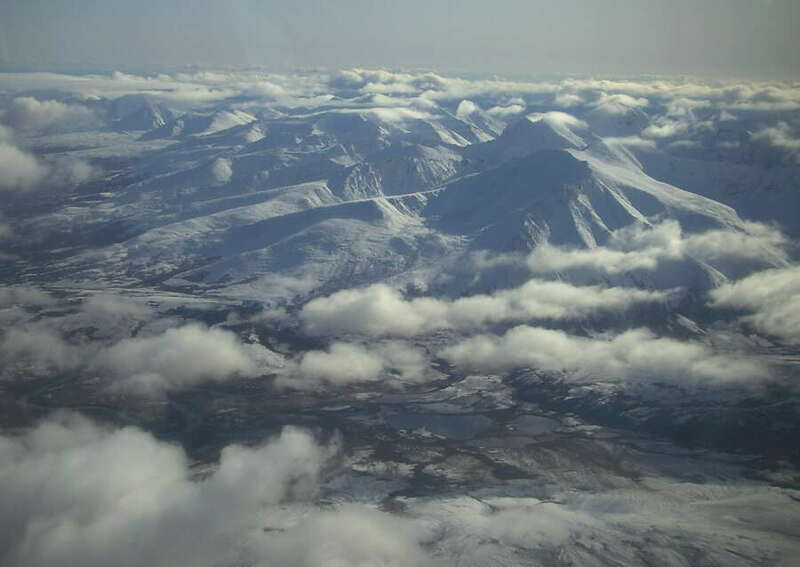 We’ve seen plenty of frost and snow, though this is the season when western Alaska hunkers down to repeated storms of rain, wind and high water, fueled by Pacific typhoons chugging northward. By December, we will likely be experiencing extremely cold temperatures and snow. As we batten down for winter, we thank you most, most sincerely for your financial support and your prayers. We respect you. We value you. Together, we are helping improve the lives of thousands of far-flung families throughout this vast region. You and all of your intentions remain in our daily individual prayers, and you are remembered in prayer during our weekly staff meetings, too. God be with you. And thank you! MAKING MUSIC: (left) Musicians from the village of Wales, joined by relatives from Anchorage, perform in the school gymnasium in the village, a tiny, isolated community of 138 people located 109 miles northwest of Nome. The occasion was the annual Kingikmiut (pronounced approximately king-GIKK-myoot) Festival, three nights of enthusiastic drumming, singing and dancing. KNOM volunteer Leah Radde was there to report on the event and record the traditional Eskimo music, adding to our library of 700 Alaska Native performances. Wales is a remote, windy point, just 50 miles from the Russian mainland. Once a large community, it was decimated by the 1918 influenza pandemic. Its hardy residents largely live off the ocean and the land. Leah reports that while she was there, people were hoping for a north wind, so clams would wash on shore. For volunteer Linda Maack, it was a journey of just 59 miles to Teller (left), a village twice the size of Wales, for a similar gathering. Teller was established as a gold rush mining town which once boasted 5,000 residents. 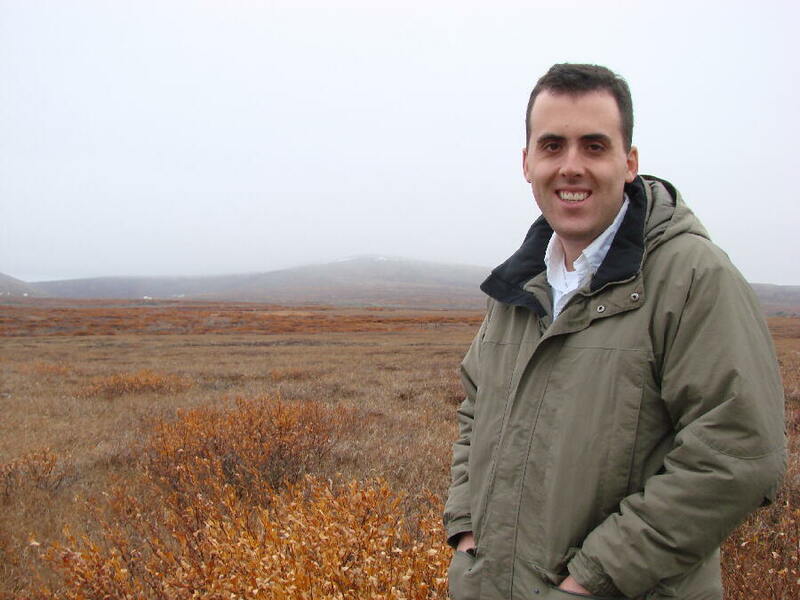 Like Wales, it is populated almost entirely by Inupiat (in-OO-pee-at) Eskimo people who are proud of their rich heritage. Virtually all are daily KNOM listeners. 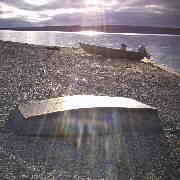 (Left) A view from Teller's gravelly beach. Leah’s and Linda’s transportation was donated by Bering Air, which has given the KNOM Radio Mission more than $100,000 worth of free air travel over the past twenty years. 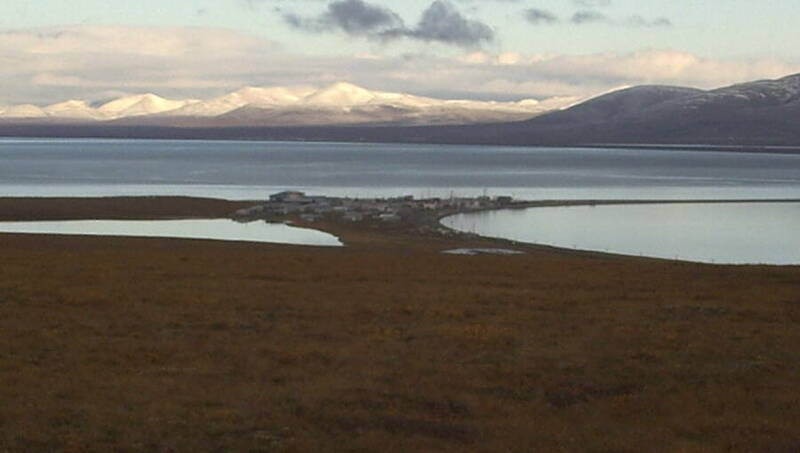 (Below, left) In early October, mountains between Nome and Teller are already covered with snow. We thank Bering Air, and we especially thank you, for helping us honor, document and preserve Alaska Native culture. Thank you! (Below, left) The locations of the villages of Wales and Teller. 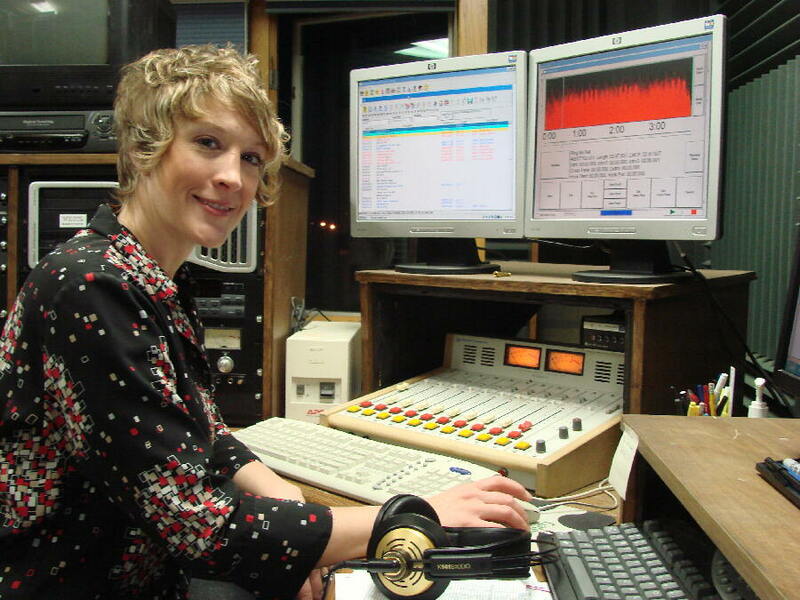 The KNOM Radio Mission is the oldest Catholic radio station in the United States, beaming inspiration and education across 100,000 square miles—thanks to you. 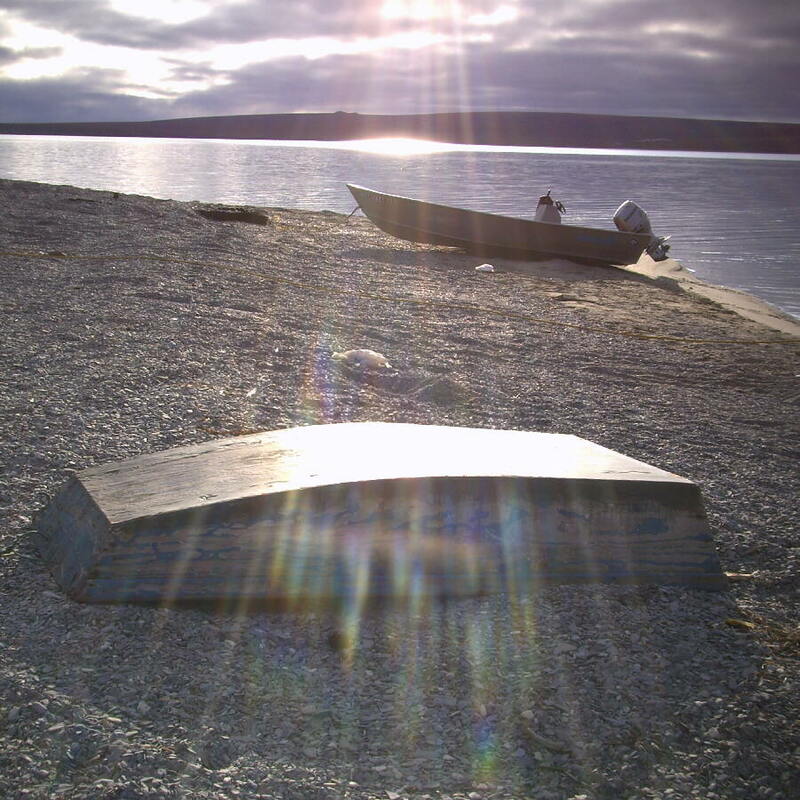 KNOM serves to inspire, educate, inform, preserve Alaska Native culture, provide positive companionship, and improve the lives of the thousands of families who live in our vast, road-less coverage area. Surveys indicate that in the dozens of villages we reach, up to 100% of adults are daily listeners. INSPIRATIONAL SPOT: Each new batch of dirty dishes, dirty laundry, every dirty floor reminds me of two things. God continually takes my sinful ways and reconciles them back to holiness. And, God is continually blessing me with the ability to work, and blessing my family with nutritious food to eat, warm clothes to wear, and a loving home. INSPIRATIONAL SPOT: There’s a story about four people named Everybody, Somebody, Anybody and Nobody. Somebody got angry about that, because it was Everybody’s job. Everybody thought Anybody could do it, but Nobody realized that Everybody wouldn’t do it. It ended up that Everybody blamed Somebody when nobody did what Anybody could have. The room is filled with computers and is too noisy for recording spots or news interviews, but it’s upstairs and out of the way, and a great place to dub (transfer recordings into the KNOM computer system), or edit and review recordings using headphones. From Fremont, Nebraska, Kelly joined KNOM as a volunteer in 1998. She left in 2000 with no intention of returning, but in 2002, did just that. A window is behind the left-hand computer monitor, and you can see, although this photo was taken at 9 AM in October, Nome is still pitch dark. WHEELS WITHIN WHEELS: KNOM volunteers hitch up for a year or more of hard work for little more than room and board. As daunting as that can be, it’s not unusual to find KNOM volunteers reaching out and helping in the community, as well. In addition to her duties at the mission, in her spare time volunteer Danielle Sylvester is an Emergency Medical Technician who is often on call for the Nome Volunteer Ambulance Service. If that weren’t enough, Danielle recently taught forty-eight 1st through 5th graders at a 3-day weekend soccer camp. The event was free, and thanks to local donors, every child received a soccer ball and a water bottle. “It was a lot of fun,” Danielle says modestly. Please consider adding the KNOM Radio Mission to your will. We prayerfully place all bequests into funds that provide for future major improvements, and protect the mission from future emergencies. INSPIRATIONAL SPOT: Nothing is unimportant in a life lived for God. REACHING OUT: (left) From Rahway, New Jersey, Dave Dodman is remaining with the mission as outreach director after three volunteer years. It’s a new position. In addition to his on-air work, Dave will “put a public face on KNOM,” using the Internet. You can find Dave’s work on Facebook and Twitter, and by the time you read this, Dave is hoping to have a KNOM news “podcast,” allowing anyone to listen to a weekday KNOM newscast by computer. He’s also point person for the mission’s web site. Dave’s Facebook postings quickly drew 100 permanent web fans, and less than six weeks from the word getting out, we’re at 202. “I’m very gratified,” Dave says. Dave has his hands full, as he also serves as first contact for inquiries by prospective volunteers, and will represent KNOM at a handful of college volunteer fairs. In his spare time, Dave serves as cantor for Nome’s St. Joseph Parish. You’ll always find him with a warm smile and a helping hand. We thank God for Dave and his work. Thank you for helping him spread the word! General manager Ric Schmidt continues to produce “Today in History,” a unique spot every day in a series which then-manager Tom Busch premiered in 1981. Ric will tell you, and Tom remembers, that producing the spot is a burden, but it’s immensely popular. More than 10,200 individual “Today in Histories” have aired, and we hope you’re as proud of them as we are. INSPIRATIONAL SPOT: Even when He reveals Himself, God remains a mystery beyond words. 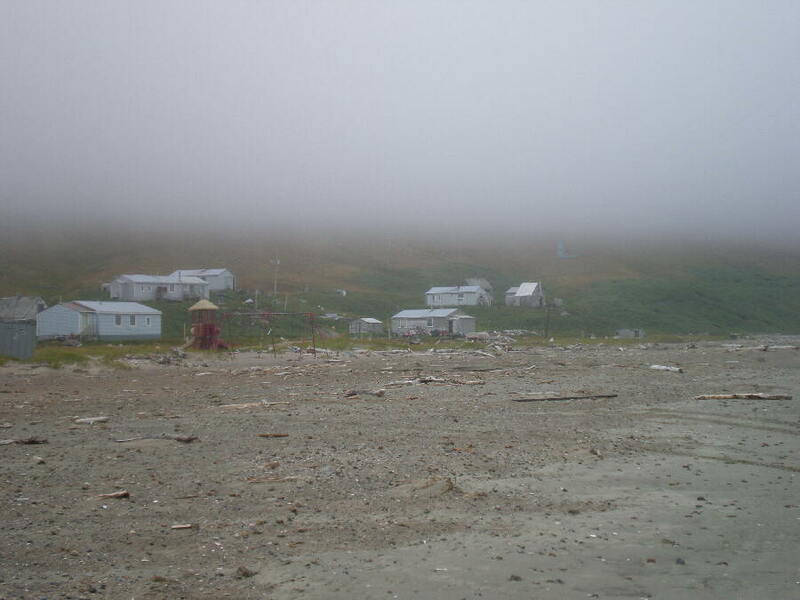 REMOTE: (left) The tiny, rugged subsistence village of Wales enjoys lots of beach and lots of weather. TWENTY YEARS AGO: November 1989’s Nome Static is four pages, for the first time. Transmission #272 details what the station has learned about listeners who live in the Soviet Union. 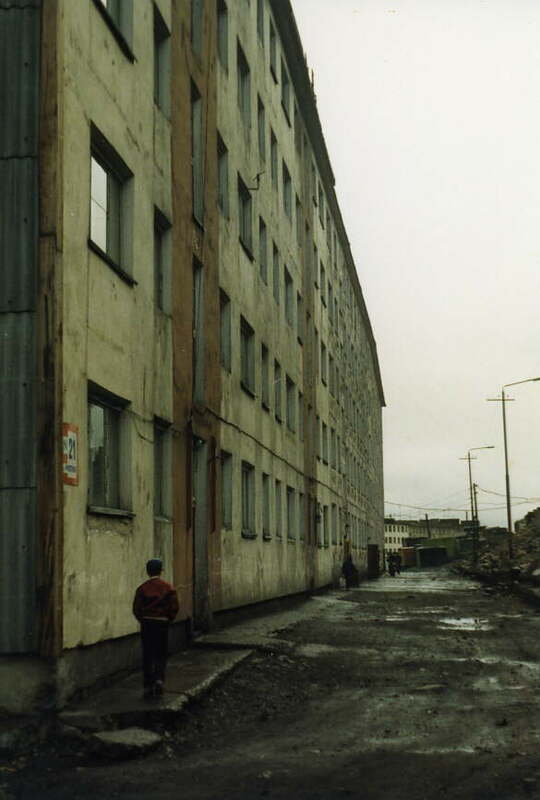 (L:eft) An apartment building in Provideniya, USSR, in July 1989. 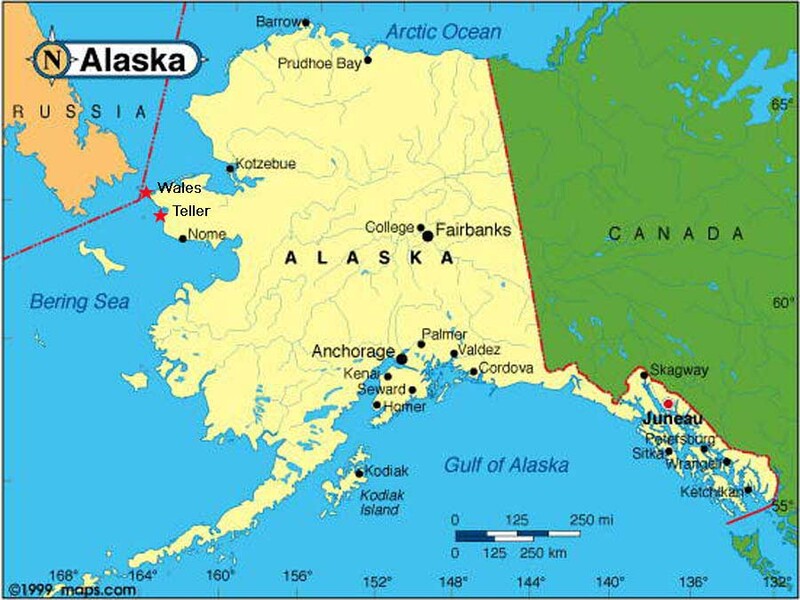 Thanks to glastnost and perestroika, new policies of the Soviet government, Alaskans and Russians increasingly develop friendships across the Bering Sea. 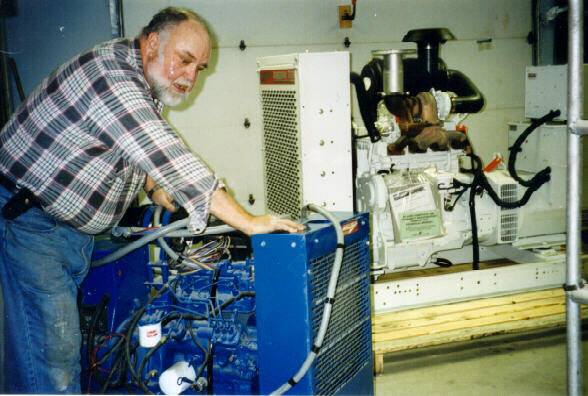 TEN YEARS AGO: In November 1999, the studio emergency generator is replaced by a much larger 55-kilowatt unit. Sale of the old generator to a wilderness gold mine pays for 60% of the cost of the new one. (Left) Engineer Les Brown, and two helpers, unseen, maneuver the new 2,456 pound generator into place. YOUR GIFTS help bring the KNOM Radio Mission’s broadcast of the Mass to thousands of worshipers across this huge area. For most Catholics, it is their only opportunity to pray with the Holy Sacrifice. Thank you! 31,100: That’s how many inspirational spots KNOM has broadcast so far in 2009, plus an equal number of educational ones, thanks to you. Thank you! WE DO THANK YOU, and it’s impossible for us to thank you enough. We renew our long standing pledge that out of respect for you and your privacy, we will never provide your name and address to anyone. We continue our pledge of prayer for you, and once more, we honor you for joining in our work to educate, inspire and inform in a region where almost any social ill you can think of exists at levels two to four times the U.S. average. Thank you, and may Our Almighty Father reward you a thousand fold! Copyright � 2009 KNOM. All rights reserved.